I guess this might be a good place to make my first post. I'm an aspiring oldster who has accumulated a motley pile of arms, want to resume reloading, and hope I have reached a point in my life where I can enjoy some range time "just because." So here's my situation: I have a Lee-Enfield that has been converted to .410. This one has supposedly been reamed to take actual .410 shells rather than the original .303 Brit case straightwalled to produce a shotgun shell. I learned a long time ago that the gun is straight cylinder rather than the usual tighter-than-tight choke of the average commercial .410. I also learned that it shoots rather accurately with slugs. As this is an expensive habit, I was wondering what is the best advice for loading slugs, is there a suitable mold, etc. I have a large stock of dead-soft sheathing lead left over from my blackpowder days and so far have only used it for .455 Webley loads. Was hoping there is a mold out there that would work. It's been a while since I have loaded shotshells and then mostly shot loads for 20s and 12s. I spent most of my loading time on pistol cartridges and some rifles. I have a Lee Turret Press and a single-station press as well. I don't currently have a .410 rig. Please advise me. I've been out of circulation shooting-wise since the Great Recession and don't know what products may be currently available. For slugs you don't really need a 410 rig. Getting hulls can be challenging, but often you can scrounge at your local range. Being a white haired 410 shooter as I am, buying once fired is my personal choice. 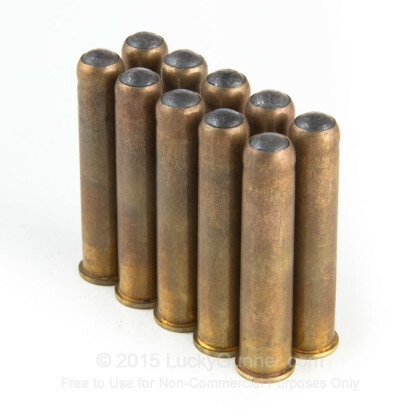 Using a commercial wad and 38 caliber slugs works well in all I have played with. The wad petals must be trimmed to length but is done easily with scissors. Larger projectiles can be used with flat fiber or paper wads. Cutting overpowder wads is fairly easy and cuts cost if labor doesn't figure in to your situation. Wads also make adjustments for OAL very easy. All but my auto-loaders get shortened 410 "specials" which I make to alleviate wad usage. Cutting hulls is simple and I have learned that close attention to the finished product is unnecessary. Sealing the charge is important! Although we did very limited chrono work, we found shell length had little effect on velocity. With no formal 410 rig, you can seal overshot wads with hot glue. Of the propellants in inventory, Hercules 2400 was our best performer. A single projectile gave much better accuracy results than multi-ball type loadings. The boys we did this work for, were very successful on Turkey. A single attempt at feral pig killing, made the decision of no deer hunting, easy. I hope my information will be of help to you. My data on 410 loading is quite extensive, contact me for further help. Keep an eye open for a .410 round ball mold. This will give you a 100 grain slug for your enfield. I found one of these molds on ebay a few months ago. Single cavity mold with Green Mountains name on it. Casting with 30:1 Pb/Sn gives 410", hardball alloy 0.412". 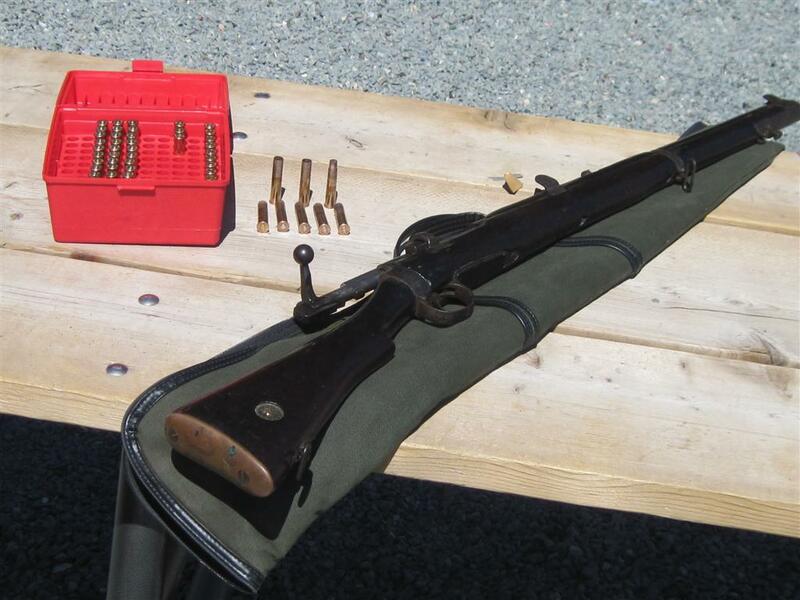 Mine is still chambered for the original .410 Musket so I use .303 British cases fire-formed straight. Don't see any reason that you couldn't do the same? They'll come up a hair short (about 2.21" rather than a full 2.5") but that really shouldn't affect performance very much. 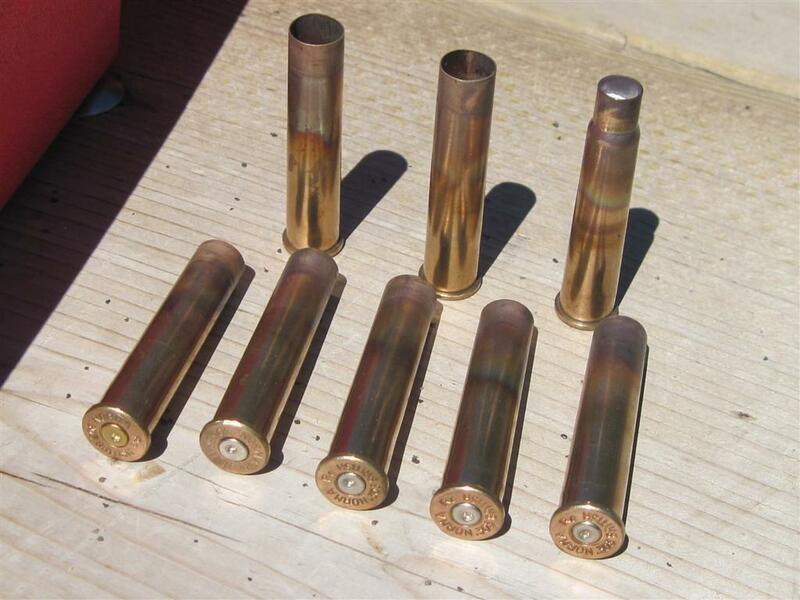 If you have any .30-40 Krag brass available you could form some cases from those which would finish at a slightly longer length. I anneal the cases about 1/2 way down, then prime them and load about 7.5 grains of fast powder (Nitro 100 in my case since I have lots of it), 1/4 sheet of toilet tissue pressed in a with a wooden dowel, then bulk yellow cornmeal up to the case mouth. I press in another 1/4 sheet of toilet tissue to hold everything in place during transportation to the range, and then fire-form them. I've been using Norma brass (again because I had some on hand) and haven't had a case split during fire-forming so far. I also bought an RCBS .410 double cavity round ball mould to make full sized, bore diameter round balls to use in my Lee Enfield. These are what the Brits used to load a variety of military rounds for the .410 Musket cartridge. I'm planning on duplicating some of these loads to test in my No. 1 MK III in .410 Musket. A suitably sized PBCB, which has a cupped rear base will shoot quite accurately in my experience for the same reason that a thrown dart seldom lands any way except point first. Btw, I sometimes see metal, once fired, boxer primed .410 cases at the gun-shows that should suit your needs well. Haven't seen those for some time. I seem to recall some Russian-made stuff manufactured primarily for the Saiga 410s. Probably Berdan-primed though. Those would also be good for my Judge. I've found some plastic hulls are prone to stick in its chambers. Mag Tec makes 21/2" brass cases. LPP I believe. 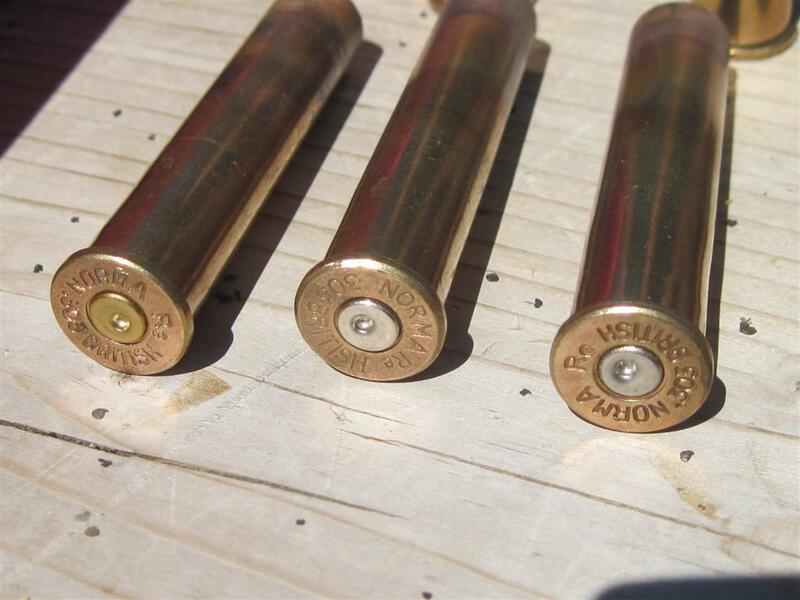 The Russian steel 410 shells are Berdan primed, but you can drill them out and install standard US 209 primers easily. 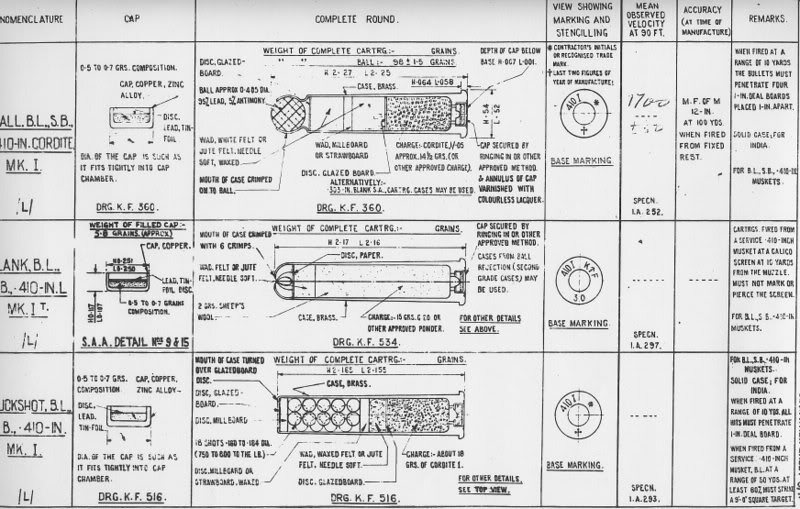 They are about 2.75" long and will not fit in a 2.5" Judge cylinder. They do work well in any 3" chambered gun however. Marlin 444 brass is easy to get, very strong and works most of the time in standard 410 guns (may have some extractor issues). I did not find it to work very well in a 2.5" Judge as the multiple steps in the chamber cause the brass to become very hard to eject, to the point that you may break the ejector rod. I would guess that would be the same problem with the MagTec shells. Another alternative is to use Norma 9.3x74R brass blown out to full diameter. Just pricey. My smoothbore No.III Mk.1* shoots blown-out .303 casings. The l.o.a. 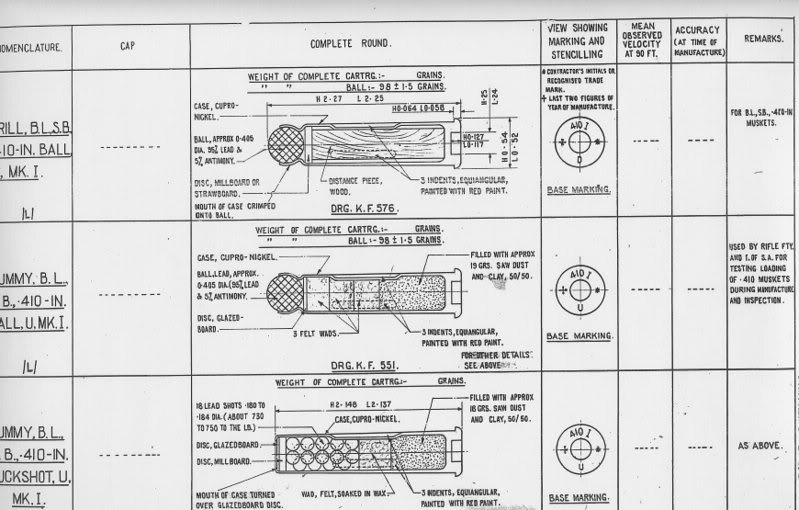 of the casings is 2 and 3/16ths inches or 2.1875". Basically a full length .303 casing.